You CAN Hurt No More! You CAN Fight for YOUR Life! Ready to Live the Life You’ve ALWAYS Wanted? Because that Life Really CAN be Yours! and the reason I wrote, "Hurt No More?" ….I think when we are confronted with moving forward in life, especially when we experience abuse, it makes it difficult to move forward. I know I experienced that repeatedly. It’s terrifying to move forward when you’ve been told you won’t make it repeatedly. During my marriage, my husband had a jewelry store and I had 4 retail stores. I was grossing 1.5 million a year in my stores. I survived of course, but lost the businesses (he sold them off and put the money in Lebanon) – not to mention taking 500K out of my house to pay for legal fees. Shortly after that, brushing that painful past, I started a daycare. It was a top-notch well known, plus had a 1 year waiting list. It really was the most treasured job I ever had! Unfortunately, I got sued, spent my entire savings and took another 200K out of my house to pay off the attorney (I won -- but at what cost -- I lost everything I had). After that I started a jewelry business, I already knew all about jewelry because of my husband, so I became a designer, spent 100K on jewelry and shortly later the market took a huge dive. I lost again. The medical bills were my final hurrah of my money. Not a penny left, I lost my home, cat, dog, belongings, moved from my real family and friends, had to leave my church family and my position as staff/pastor. Had to move in with my dad and step-mom. Will the Failures Ever End? From one failure, to the next, to the next, to the next... One loss, to the next loss, to the next... until I have nothing left. Sometimes fear of failure strikes me, wondering what will happen next. But there is something in me that fights. I think about Abraham Lincoln who had so many failures before he became president. And Adam Graham Bell, and Edison, each one had one failure after another but they pressed through. Although this seems to be about loss and failure, it’s actually about rising up and be who you really are – who God has created you to be! You can hurt no more. You don’t have to live in a life of loss, abuse and failure, you can brush off your past and discover an amazing life – the real one God wants you living! I remember the Lord saying to me once: Kelly, failure happens when you quit; success is getting up one more time and trying again. Is Life Really My Choice? I want to encourage you that your life is a choice, you can choose the next steps in your life -- to hurt no more, living in abuse is a choice, and there are so many options to help you out. This book is not only about your options of getting out of your situation, but it’s a word of comfort, a book of healing, hope, wisdom, and guidance to living a beautiful life, the life you were meant to live. You can hurt no more. Don’t give up dear friend, your hopeful future is just around the corner. Really! Are you ready to hurt no more? Don't let another day pass you by, don't let another day of depression, hurting, sadness take over your life. Because you DESERVE BETTER! You deserve to heal from abuse and hurt no more. It's easy to believe we are getting what we deserve and there is no hope to get out, but I want to encourage you, there is hope. You don't have to give up. I, Kelly, had all the same fears, I even had additional fears of my ex-husband taking my children to another country where I will never see them again. I had threats of no money, no family to help, my situation appeared hopeless. But the truth was, those were his threats and I had found enough resources to help me find my freedom from him. In this book you will see my own pain going from depression, suicidal, and sleeping in bed all day to making sound decisions to wanting to live again. Personally, I believe if I can do it, any one can. I know everyone says that statement but in my case, I know what a basket case I was, how timid, terrified, and hopeless I was and I was able to make enough changes to find healing through prayer and the Word of God. I was able to see the hope God had for me. Please don't wait another minute, fight for your life, fight for your children's life, your family's life, and everyone else in your life. They need you more than you think. The reason I believe "Hurt No More" can help, is because it was my life. Ready to Heal from the Inside Out? This book is about healing from the inside out. It is filled with life experiences, how-to's, and prayers that move you in the right direction, and it has 100's of resources to get you going in the right direction. Don't wait, please order now! In Hurt No More! 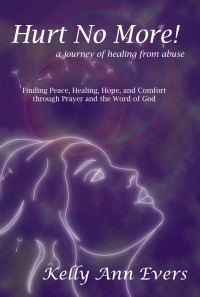 A Journey of Healing from Abuse, Kelly Ann Evers reaches out to abused and battered women with her own compelling and inspirational story. After escaping from her abusive husband, she was unable to enjoy her new found freedom because of the emotional, physical, and spiritual scars left from years of domestic violence that kept her feeling hopeless, defeated, and depressed. Determined to set herself free from her suffering, she found the courage to search for true happiness and a meaningful life. 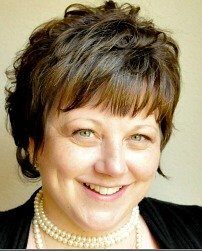 It was through the Word of God and prayer that she finally attained deep healing from the abuse--and so much more! Today she can honestly say that she lives a beautiful life! With love and wisdom, and through personal experience, Kelly helps readers discover the power of prayer that heals the deepest pain of abuse. With 1 out of every 3 women in our nation experiencing abuse, women are looking for answers to healing. Her desire is for you not to give up or settle for anything less than God’s perfect purpose for you. “Hurt No More!” gives you the desire to put one foot in front of the other – trusting God with all your concerns – and teaches you how to tap into His strength by soaring above life’s tests and trials through prayer and the Word of God. A Beautiful Adventure is Waiting for You! Be healed from abuse once and for all. Enjoy a rewarding life, filled with hope, self-confidence, happiness, peace, and comfort. Change your life with powerful prayer. Be free from hopelessness and depression. Change your life by changing how you think. Be strengthened through God’s love. Discover the life-changing power of true forgiveness. Believe in yourself as much as God believes in you. Trust God regardless of the situation. Discover the joy of investing in yourself. ... just as a side note, if you purchase the book, "Hurt No More" (or any products I sell), and you are not pleased with it, just let me know and I'll refund the amount fully. No need to send back the product, just let me know the total amount of what you spent (tax, shipping, and whatever else), and I'll refund it ASAP. Your peace and happiness is more important to me than the cost of a book! Prefer Smashwords? We've got that too :). Order Hurt No More E-book Now! Return to Domestic Violence Help from Hurt No More!